Germany's Far-Right AfD Party Is Making Its Presence Felt Alexander Gauland, the head of Germany's Alternative for Germany (AfD) party, made recent remarks about the Nazi era that offended many Germans, but critics say it's all part of the AfD's playbook. Alexander Gauland walks from the Brandenburg Gate to the Bundestag in Berlin after he delivered a speech during the "demonstration for the future of Germany" called by the far-right AfD in Berlin on May 27. Last weekend, Gauland caused outrage in Germany when he called the Nazi era "just a speck of bird s*** in more than 1,000 years of successful German history." 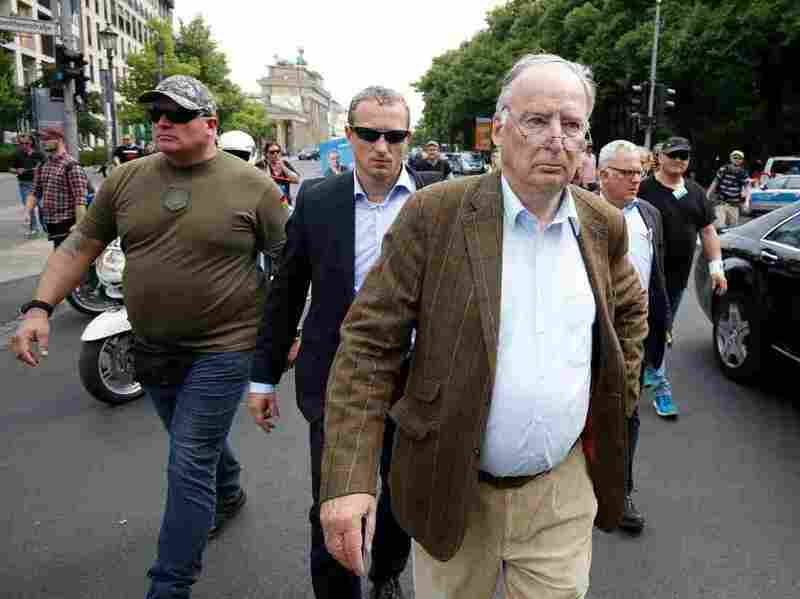 Alexander Gauland, the head of Germany's far-right, nationalist Alternative for Germany (AfD) party, provoked widespread public outrage and dismay last weekend when he called the Nazi era "just a speck of bird s*** in more than 1,000 years of successful German history." "We have a glorious history," he told the AfD's youth organization last Saturday, "and it, dear friends, lasted longer than those damn 12 years. Only if we acknowledge that history do we have the power to shape the future. Yes, we plead guilty to our responsibility for those 12 years. But, my dear friends: Hitler and the Nazis are just a speck of bird s*** in more than 1,000 years of successful German history." In elections last September, the AfD became the first far-right party to win seats in the Bundestag in more than half a century, raising concerns among mainstream politicians about the effect the party, with its populist, anti-immigrant agenda, could have on German politics. As opposition leader, the AfD chairs the parliamentary budget committee. As the biggest opposition party, it also has the right to respond first to any statement issued by the government, ensuring publicity and a national platform for its messages. "The AfD is trying to split society," the German daily Süddeutsche Zeitung recently warned. "And there is a crack in the Bundestag." Chancellor Angela Merkel called Gauland's statement "shameful" coming from a member of the German parliament. She was not alone. Public reaction was overwhelmingly negative. The host of one of Germany's best known political talk shows announced that he would no longer invite Gauland on the show. And Gauland's comments were rebuked by all parties in the Bundestag — including his own. 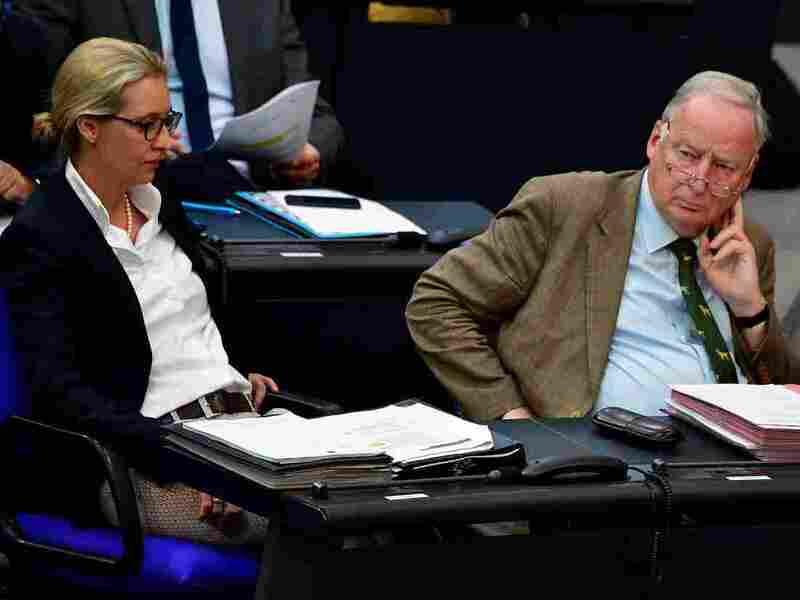 It was the first time that voices within the AfD firmly criticized their leader, even though this was not the 77-year-old ultra-conservative's first verbal affront. (There was no criticism last year, for example, when he said the government's Turkish-German migration commissioner Aydan Özoguz should be "disposed of" in the Turkish region of Anatolia). Uwe Witt, head of the Alternative Center, a working group of the AfD, was one of the critical voices this time. "As a politician of the AfD, I apologize to all fellow Jewish citizens, as well as the victims of the Nazi regime and their families, for this unbelievable trivialization by our chairman," he said on Twitter. The "bird s***" remark could cause legal trouble for Gauland. A complaint filed against him accuses him of inciting hatred. According to the German criminal code, the punishment could be a prison sentence or a fine, but it is unlikely that Gauland will be convicted. Following an AfD leadership crisis summit, Gauland said he regretted the effect his statement had had. He claimed he had been misunderstood: "Nothing could have been further from my intention" than to trivialize Nazism, Gauland said. Konstantin von Notz, a member of parliament from the opposition Green Party, calls Gauland's remarks "a serious attack on democracy, diversity, equal rights and the rule of law." With the AfD's arrival in parliament, Germany "now faces a development that had already reached many other countries in recent years," he says. The AfD leader's remarks are a textbook example of the party's strategy, says German-Israeli historian Michael Wolffsohn — a way to provoke and keep opponents off balance. Alternative for Germany leaders Alexander Gauland and Alice Weidel listen to German Chancellor Angela Merkel answer questions at Germany's parliament on June 6. "This is not only a matter of Gauland," he says. "This is the propaganda strategy of the AfD: classical brinkmanship. By a hair's breadth at the far-right margin, but still on the edge. Legal prosecution can be avoided, yet at the same time, there is a reaction of maximum attention caused by provocation. The opponents of the AfD fall for this strategy. Their reaction makes [the AfD] even stronger." Hajo Funke, Germany's leading expert on the German far right, tells NPR that Gauland's statement reflects "a new degree of radicalization" and clashes with decades of understanding within Germany. "It is about the rejection of the lessons and consequences Germany learned through the time of the Nazi era," Funke explains. "This is directly connected with the [AfD's] racist exclusion and devaluation of ethnic and religious minorities such as German-Turks, Muslims or refugees. Below the surface, there is also a great extent of anti-Semitism." The far right "radicalizes more and more by the hour"
For the Green Party's von Notz, Gauland's remarks are a sign of ever-increasing radicalization: "The AfD seems to radicalize more and more by the hour," he tells NPR. "We will see where this might end, but we know from our historic experience this development is more than dangerous." Funke warns of "polarization," but the public outrage following Gauland's statement, he says, shows that "almost 80 percent of the German society demonstrate a united front against this radical party." Still, he warns, the AfD poses a "danger for the liberal order and the rule of law .... If ever in power, they would destroy that very order. The majority of their activists demand national revolution." The AfD is speaking to public discontent, he says. But can this party govern? "The ordinary citizen has to consider whether any of his interests will be preserved, other than unleashing their fury on the established parties," Funke says. "Most decisive for the future development is the extent to which democratic parties successfully address the social and economic fears of the citizens on both the national and local levels. They must also govern competently regarding Europe and the many crises of the world."